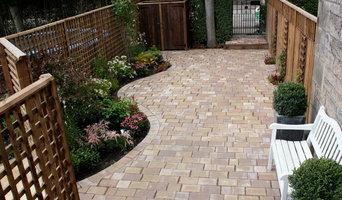 Paving –Driveways, Patios and Paths, Paving Solutions. Walls – Stone and Brick and Retaining Walls, Rendered concrete block. Timber Services – Fencing, Pergolas, Arbours, Sheds, Summer Houses. 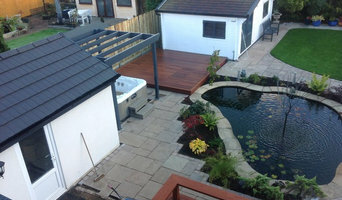 Decking – Bespoke Decking Service, Hard or Soft Wood Decking Boards, Balustrading. Garden Features – Water Features, Ponds, Garden Lighting, Statuary, Specimen Planting. Lawns – Turfing, Seeding, Lawn Shaping. Planting – Designing and Installing Planting Schemes, Raised Beds. Design & Build Service – Garden Design, Supplying Free Quotes, Professional and Quality Services, Garden Renovation, Garden Plans available. From a wee bit of weeding to a complete garden overhaul and everything in between we’ve done it and do it all. Based in Edinburgh and covering central Scotland, Spruce Garden Services are ready to meet your garden’s needs. Hard working, reliable, qualified and fully insured we can guarantee you a job completed to very high standards for a fair price. Our hard landscaping is regularly inspected by an independent body and scores top marks across the board. As a member of Rated People our work is rated by our clients and has consistently scored the top 5 star rating since joining three years ago. But don’t just take our word for it, we are proud of our work and as we have great customer relationships we would be delighted to take you to see some of our jobs nearest to you at your convenience so you can see for yourselves the quality and attention to detail you’ll enjoy whatever the size of job you have for us. 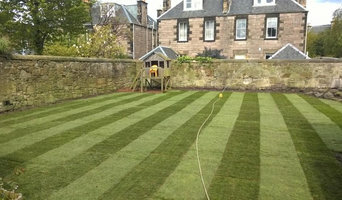 Colinton Gardening Services - garden landscaping for Edinburgh Professional garden landscaping, and garden designer for Edinburgh. We are qualified, insured and professional garden maintenance, garden landscaping & tree surgeon company. Some of our services include : garden landscaping (garden decking, garden patios & garden paving, driveways, dry stone walling). expert soft landscaping including plant choice. garden design - we can produce hand drawings and 3d models of your garden design project. Qualified, insured and very professional. Please contact us for a free, no obligation consultation. Experience counts for everything. We have the pedigree to show this with a wide range of landscaping customers and clients throughout Edinburgh and the Lothians. John Lessels landscapes has been providing hard and soft landscaping services throughout Edinburgh and the lothians for over 35 years. Our experienced team of landscapers are fully qualified in all forms of garden construction, allowing us to complete jobs to the highest standards. John Lessels landscape gardeners prides itself on high quality workmanship with an acute attention to detail, we have worked on large and small scale landscaping projects throughout Edinburgh and the Lothians managing projects from the inception to completion. For over 35 years, John Lessels landscapes have been meeting the highest standards of landscape design and exceeding the expectations of our customers located throughout Edinburgh and the lothians. Our strengths most definitely lie in giving a one-to-one service. 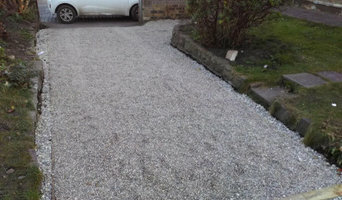 We work with a varied type of customer from simple driveways through to complex projects which provide us with some fairly challenging prospects, but we always work and strive to deliver the highest possible quality product for you. 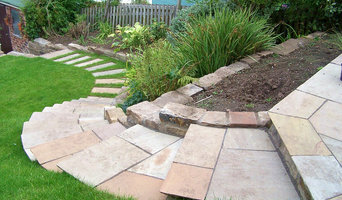 We are experienced and work very much as a team, with our landscapers and maintenance guys all instilled with the same belief - do a good job for someone and what goes around comes around, we wouldn't be one of Edinburgh and the Lothian's leading landscaping contractors if we left less than satisfied customers. We are a family-run, friendly and cost-effective solution to your landscaping needs and we can also advise on planting, patio design, types of paving and driveway material to use. For the past 21 years Off The Rock Garden Landscaping has been designing and building gardens from New Zealand to Edinburgh. We are driven by both passion and pleasure, for us transforming gardens has always been a joy. First and foremost if a job is worth doing it is worth doing right. At Off The Rock we have always prided ourselves on the quality of our workmanship and the service we have provided for all our clients, and we are proud of it. Our aim when developing an outdoor space be it for domestic or corporate clients is to listen to their individual needs and then based on our expertise and our clients desires create a beautiful, liveable space for all to enjoy. If you are looking for a company to go that extra mile to create your dream garden or if you want expert advice on how to maximise the potential of your garden then please do get in touch. We are passionate about plants and the benefits they bring to any organisation or property. We design, create and install Nordik Moss walls as stunning features for all types of environments. Check out this video <a rel="nofollow" target="_blank" href="https://www.benholm.com/watch-the-nordik-moss-video">https://www.benholm.com/watch-the-nordik-moss-video</a> Interior and exterior plant displays supplied and maintained. Established in 1993. Greenscape is an Edinburgh based landscaping and grounds maintenance Company providing a high quality professional service for commercial and private clients. Established for 20 years, we have the knowledge, skill, experience and environmental awareness to provide you with the best possible service Greenscape carry out work for Residents' Associations, Local and National Companies, Councils, Architects and Private customers in the Edinburgh and Lothians Area. Having designed several gardens from scratch and carried out all aspects of project management, SUSIE COUPAR is pursuing her love of garden design having started her own EL garden design and planting planning business “The Lady Gardener”. We are a company of 6 staff including myself. We have been involved in landscaping for many years and give every customer the same professional service weather a small project to the very large projects we carry out. Why should I hire a Rosewell, Midlothian gardener or landscaper? Even if you do have a few green fingers yourself, gardeners in Rosewell, Midlothian will have the experience and training to carry out larger landscaping projects and will have the eye for what works best where and when in your garden. They may work with a landscape designer or architect who will put together the plans that they then execute, or they may do this work themselves. If you’re looking for a Rosewell, Midlothian landscape architect, or perhaps you want to select your own garden supplies yourself, then you can find the right professionals for this on Houzz, too. Here are some related professionals and vendors to complement the work of landscape contractors: Landscape Architects & Garden Designers, Garden & Landscape Supplies, Stone, Paving & Concrete, Tree Services. Once the plants have been chosen, planted or potted, and the lawn or patio laid, then your garden will be ready to enjoy, but never completely finished. Like all living things, your garden will grow and change with time and the seasons, so it will need a bit of TLC and garden maintenance from time to time. This is when you may want to hire Rosewell, Midlothian gardeners again, especially if you have a very large garden or landscaped area that needs constant upkeep. Hire Rosewell, Midlothian gardeners to water, weed and prune your plants, keep the lawn trim and green, and cut back any over growing trees. Some Rosewell gardeners may source their own garden supplies, while with others you may have to do this yourself. Find landscapers or gardeners on Houzz. Narrow your search in the Professionals section of the website to Rosewell, Midlothian gardeners and landscape contractors. You can also look through photos of Rosewell, Midlothian landscapes and gardens to find one you like, then contact the Rosewell, Midlothian gardener who worked on it.